What Paint Did Jackson Pollock Use? The drip paintings of the abstract expressionist painter Jackson Pollock (1912–1956) are among the best-known paintings of the 20th century. 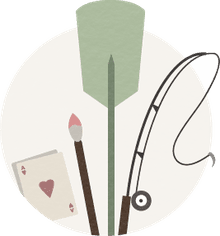 When Pollock moved from easel painting to dripping or pouring paint onto a piece of canvas spread on the floor, he was able to get long, continuous lines impossible to achieve by applying paint to a canvas with a brush. For this technique, he needed a paint with a fluid viscosity (one that would pour smoothly). For this, he turned to the new synthetic resin-based paints on the market (generally called "gloss enamel"), made for industrial purposes such as spray-painting cars or household interior decorating. He would continue using gloss enamel paint until his death. A lot of Pollock’s drip paintings are dominated by black and white, but there are often unexpected colors and multimedia elements. The amount of paint in one of Pollock’s drip paintings, the three-dimensionality, can be appreciated fully only by standing in front of one; a reproduction simply doesn’t convey this. The paint is sometimes diluted to the point where it creates a little textural effect; at others, it’s thick enough to cast shadows. 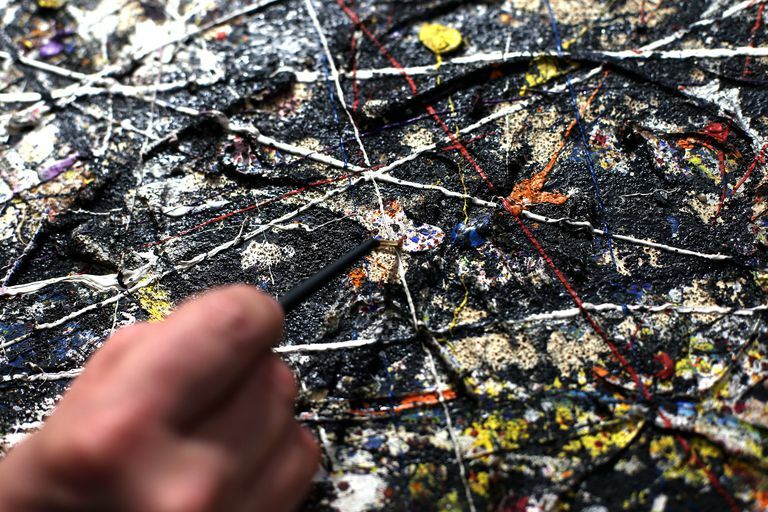 Pollock would also rest a stick on the inside of a tin of paint, then angle the tin so the paint would pour or drip down the stick continuously, onto the canvas. Or he would make a hole in a can to get an extended line. Alloway, L. "Pollock’s Black Paintings.” Arts Magazine 43 (May 1969). Quoted in Cernuschi, p. 159. Friedman, B.H. “An Interview with Lee Krasner Pollock.” In “Jackson Pollock: Black and White,” exhibition catalog, Marlborough-Gerson Gallery, Inc. New York 1969, pp. 7-10. Quoted in "The Impact of Modern Paints" by Jo Crook and Tom Learner, p. 17. Friedman, B.H. “Jackson Pollock: Energy Made Visible .” Quoted in Cernuschi, p. 89. Pollock, Jackson. “My Painting.” In “Possibilities I” (Winter 1947-8). Quoted in "Jackson Pollock: Meaning and Significance" by Claude Cernuschi, p. 105. Wright, William. Pollock interview for the Sag Harbor radio station, taped 1950 but never broadcast. Reprinted in Hans Namuth, “Pollock Painting,” New York 1978, quoted in Crook and Learner, p. 8.